A historic tower house beside the River Dee, Abergeldie Castle probably dates to the mid 16th century. The most likely builder was Sir Alexander Gordon of Midmar, later Earl of Huntly. 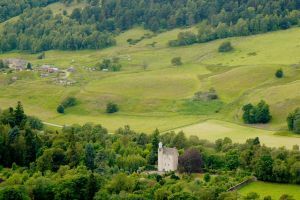 The castle was used briefly as a garrison for royal troops during the first Jacobite uprising in 1715, and later it was leased to successive generations of the royal family, beginning with Prince Albert in 1848. 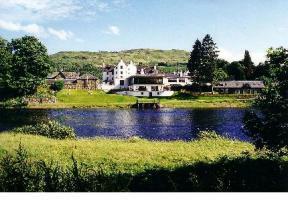 The castle stands on the south bank of the river, about 2 miles east of the royal residence of Balmoral Castle. It is composed of a rectangular block about 35 x 28 feet, with a round tower at the south-west corner. The fact that the walls are 4 feet thick speaks to the need for defence by the builders. The layout of the building and the style of architecture suggest that it was constructed by the same builder as the Castle of Balfluig at Alford, which dates to 1556. Tradition suggests that the castle was originally surrounded by a moat, but no trace of this exists today. In the 18th century a long, low wing was added to the 16th-century structure. On the lawn in front of the castle stands a late Bronze Age standing stone, about 6,5 feet high, 2.5 feet wide, and 1.25 feet thick. Like any self-respecting centuries-old Scottish house, Abergeldie Castle has a ghost story attached to it. The story revolves around a French serving woman named Catherine, or Kittie Rankie, or Frankie, otherwise known as French Kate. The unfortunate woman was accused of being a witch by her mistress, ostensibly because she told her mistress that her husband was seeing another woman. Kate was imprisoned in the cellars before being burned at the stake on the hill called Craig-na-Ban, which overlooks the castle. Since that time, Kate's ghost has been seen in the cellars and in the clock tower.